​History is an important part of Philadelphia — from the signing of the Declaration of Independence to the buildings dating to the 17th century. This year, PennDOT's District 6 office — serving the southeastern part of the state — was honored several times for its commitment to preserving the rich history of the region. From left, Monica Harrower, Meg Sherman, Shane Murphy, John Buckley, Rob Buckley, Chad Lavallee, and Steve Laws accept the Preservation Alliance Grand Jury Award for preservation of the Wanut Lane Bridge in Philadelphia..
Over the summer, PennDOT received two Preservation Alliance Grand Jury Awards for the rehabilitation of the historic Walnut Lane Bridge over the Wissahickon Creek and the Adams Avenue Bridge over the Tacony Creek in Philadelphia. The contractors and designers for the projects joined PennDOT at the awards ceremony in June. 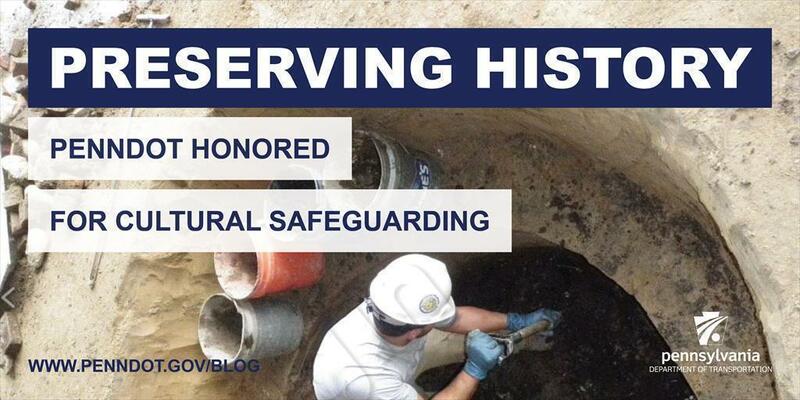 The American Cultural Resources Association (ACRA) industry award in the public sector went to PennDOT for its public outreach efforts regarding archeological discoveries​ made during the Interstate 95 corridor reconstruction. To date, 10 prehistoric sites and more than a million artifacts have been identified by the project team, which is in the process of analyzing the items ranging from the late 18th century through the early 20th century, including drinking glasses, figurines, and various building foundations. Accepting the Preservation Pennsylvania Ralph Modjeski Award for Excellence in Transportation Design, Preservation and Archaeology are, from left, First Lady Frances Wolf, Nathaniel Guest, Michael Britt, Michael Cuddy, Henry Berman, Melissa Batula, and Monica Harrower.